Both me and my husband like all animals, small land big ones so that's why our animal husbandry education. We have been members of Polish Kennel Club since 1977 and we are also mollosoid breed international judges. 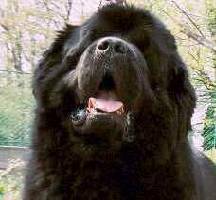 Our adventure with newfoundland dogs began in October 1976 when a black 7-week-old female puppy arrived At our peaceful life. Her name taken from the pedigree was EGA but we called Her Kaja and she came from Niedżwiedzia Gawry Breeding owned by MS Ewa Urbanowicz from Wrocław. At that time her breeding successed in having the most bred dogs with champions titles, a year later after EGA was born, a future INT CH GRAF came to this world just in that breeding. Ega grew up i became a very beautiful female, she was of perfect origin., and her mother BLANKA vom St. Lorenz-Strom (FCI), came from German breeding - still active until these days. Ega attained 3 x CACIB, 2 x Res.CACIB, 3 x Winner of Poland, 1 x Winner of Hungary. Those days there were only two dogs shows in Poznań and Opole. She also turned out to be a perfect breeding female, onlt the two litters she had, she gave life to four champions of Poland. Her first litter was the beginning of our breeding called "WICHROWE LAKI"
The second and the last Ega's litter was in January 1980, for the next one we're waiting for 5 years and 7 months. Happy mother of the puppies was SEWILLA from Chatka Elfów(The Elfs' Hut) EGA's granddaughter and CH KAJUS's daughter from Wichrowe Laki but father was Mr. Horst Hoch's CH Stanvsholt CICERO from Denmark We left CH MERCEDES Wichrowe Laki mother of TARA i ZAMPA, , grandmother of WIRIDIANA and BEATRYCZE, great-grandmother of HALSZKA KNIAZIÓWNA and INFANTKA INEZ great-grandmother of NOC NEMEZIS, STOKROTKAPOLNA, WARTY LIDY, great-great-grandmother of CARMEN CYGANKA and DIRETISSIMA DUET. Summing up, there are all our females, 6 of the last ones still live and enjoy good living. The rest I hope stay in a better world anf what is the most important they were with us to the end of their days. In November 1990 we brought from Hungary a black male GEROME de Saint-Felicien, a son of Greer's CANADIAN MOUNTIE coming from Canada. but after some time it turned out to be recessively white - black. 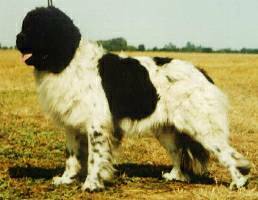 Daughter of Gerome i Tara, Beatrycze was covered by a white-black CAN CH Larinkallion CIPPIS JACULAUS and gave birth to the first white-black Newfies litter in Poland. A year later she had next white-black puppies after covering by BENJAMINEM Stupsletta's from Hungary. It was her last litter and CH ORCADES ORION Wichrowe Laki stayed with us. Young Champion of Poland, Polish National Champion NEGRESCO NERO owned by Wisia i Grzegorz Serafinowicz, has also championship of Hungary, Czech Republic and Slovakia. In September 2002, in the age of 3,5 it fulfilled all the conditions needed to be given INTERNATIONAL CHAMPIONSHIP.